This composite photo of the Eastern Hemisphere updates the 1972 “Earthrise” photo, which portrayed our planet as a vulnerable outpost of life in hostile space, thus fueling the burgeoning environmental movement. Polar-orbiting satellites, at altitudes of 500 to 600 miles, overfly the entire globe twice a day, providing information at a finer scale, but not continuously. 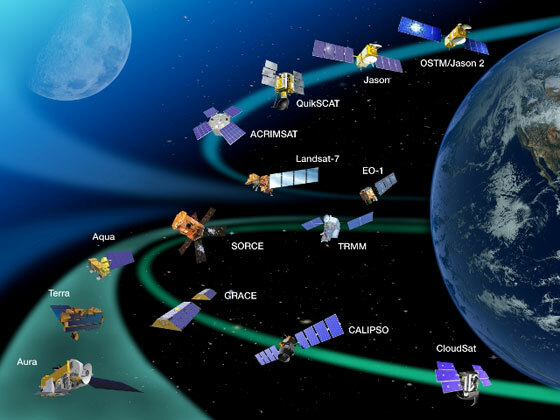 NASA and the National Oceanic and Atmospheric Administration orbit a variety of Earth-science satellites. But satellites are fragile, and they eventually fail. Earth-observing satellites have been plagued with cost overruns, delays, cutbacks and other embarrassments that remind us of a mini-space program. With weather, ignorance is expensive! At the same time, the cost of weather-related natural disasters, including hurricanes, floods and wildfires, keeps rising. In the United States, thunderstorms and the associated lightning, tornadoes and rainfall cost almost $26 billion in economic losses in 2011, a record. According to Climate Spectator , when adjusted for inflation, “the 2011 spring tornado season was the fourth-costliest disaster in U.S. history, trailing only hurricanes Katrina and Andrew and the September 11, 2001, attacks on the United States.” (Emphasis added). Variations in weather affect everything from tourism and agriculture to manufacturing and construction, and have a $485-billion annual impact, according to a 2011 study from the National Center for Atmospheric Research. The study was actually an underestimate, as it ignored the costs of extreme weather and global warming. Yet the ability to predict weather relies heavily on the Earth-observing satellites (and on airplanes, radar, buoys, computers and scientists, which are likewise under budget pressure). Eyes in the sky could even help prevent some disasters, including the fires and droughts that seem to be linked to a warming climate. Every time there’s a hurricane, we see awesome satellite photos — without necessarily considering what it will cost to replace those satellites when they inevitably wear out. Forecasting the future of our weather satellites was assigned to a National Research Council study of satellite capacity that was published in May, 2012. “We tried to use objective, verifiable information,” said study leader Dennis Hartmann, of the University of Washington. Using engineering estimates, current status and fuel supplies, the group predicted when existing missions would likely end, and also considered missions that were advanced enough to have a launch schedule. 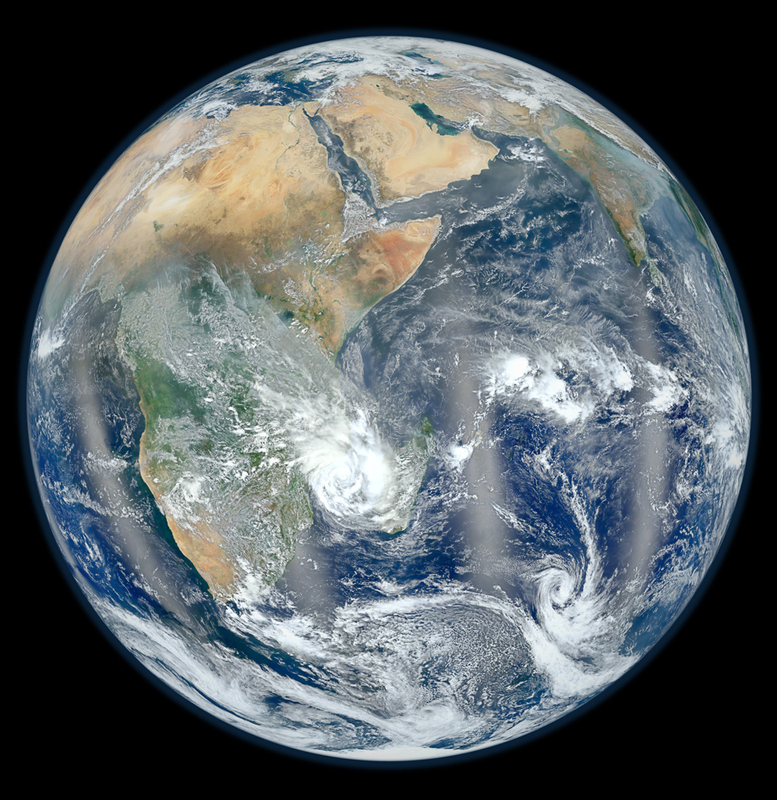 Earth Science and Applications from Space, U.S. National Academies. Experts anticipate a rapid decline in the number of U.S. Earth-observing missions and instruments will start around 2015. Aqua, Terra and Aura, three of the most capable satellites, were launched at least eight years ago. All three are working on borrowed time. A prediction is always uncertain, Hartmann admits, “But there is definitely going to be some sort of decline in the number of missions flying” by 2020. In fact, the report anticipates, three-quarters of the data flow could cease by then. We had two questions: How has this happened, and how will it matter? Earth-observing satellites are highly sensitive, mechanical-optical-electronic devices that are expensive to design, build and launch. They must operate hands-free in a harsh environment where repair is impossible (although reprogramming and rebooting from the ground can solve some problems). Both NASA: satellite; View from space. 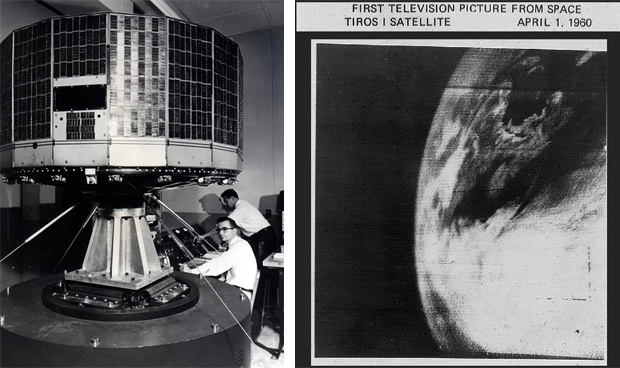 On April 1, 1960, the Television InfraRed Observational Satellite (TIROS-1), became the first weather satellite. During a 78-day lifespan, TIROS-1 proved the value of watching weather from space. NOAA (the National Oceanic and Atmospheric Administration) handles “operational” missions that are the primary data source for the National Weather Service and many environmental scientists. NOAA’s primary mission, says Hartmann, a professor of atmospheric science, must be weather, but when money runs short, NOAA is tempted to shunt some missions to NASA, which can raise costs enough to impair the search for new discoveries or technologies, even if it does sustain long-term studies of such matters as ice cover or sea temperatures. Not quite ready for the glue factory… The aging Aqua satellite, launched in 2002, shot this true-color photo of Hurricane Celia, which spanned hundreds of miles over the Pacific Ocean. 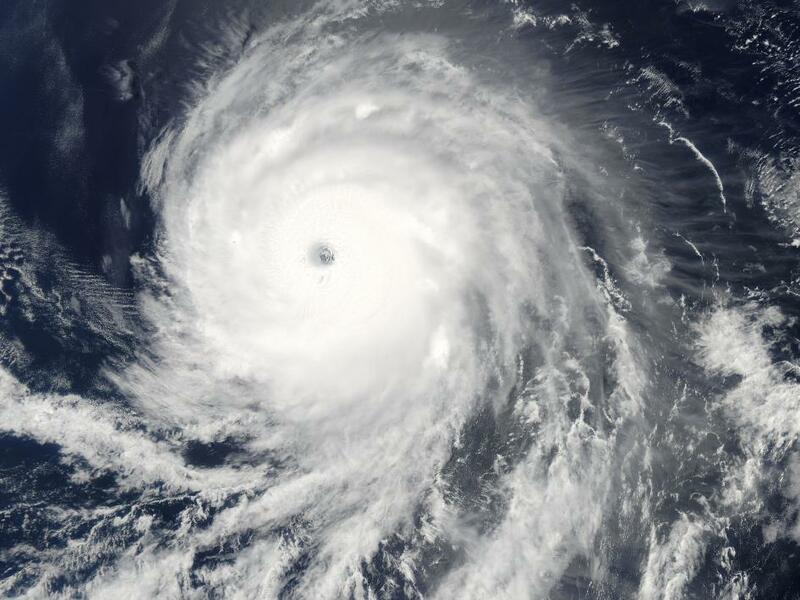 Five minutes after MODIS (the Moderate Resolution Imaging Spectroradiometer) shot this true-color image, Celia attained hurricane category 4, with sustained winds of 135 miles per hour. Weather satellites are the source of much of the data that computer models use to provide everyday forecasts for rainfall and temperature highs and lows, says Jeff Masters, director of meteorology at Weather Underground. If the weather satellites decline, those “forecasts will degrade significantly,” he says. Hurricane forecasts have two elements: the storm’s path (track), and its intensity. “I don’t think losing these satellites over the next five or so years will degrade our forecast of hurricane [tracking], but it will prevent them from getting better,” says Masters. Hurricane Katrina (plots show six-hour intervals) suddenly got a lot stronger before it engulfed New Orleans. Category 5 (the strongest hurricane) 7 a.m. Aug. 28. Six hours later, maximum sustained winds were 175 miles (280 kilometers) per hour. 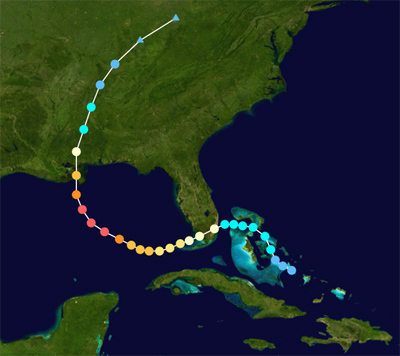 In just 12 hours, Katrina had burgeoned into the most fearsome of hurricanes. The death toll reached 1,883, and the economic toll is still being paid. Los Angeles Times, September 12, 1900. 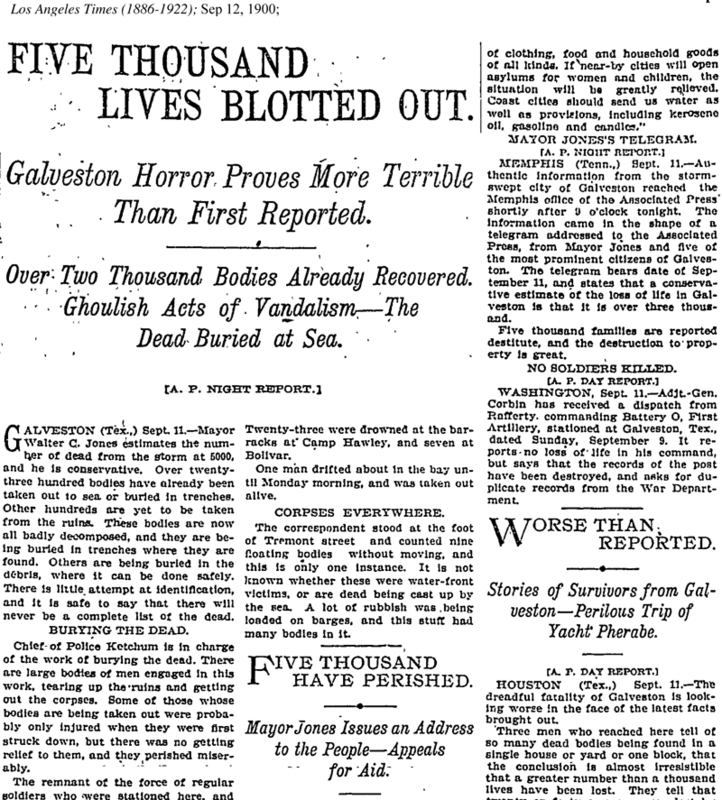 The 1900 Galveston hurricane killed about 6,000 and proved the danger of complete failure to track a hurricane. Although nobody thinks a hurricane could strike “out of the blue” today, hurricane forecasting relies heavily on satellite data. But satellite data would make “no difference” on tornado warnings, which rely on visual sightings and radar. Murphy: Does he still rule the skies? Like a rusty fender separating from the chassis on a ’57 Buick Roadmaster, loose parts can even block an instrument’s view. In some cases, Hartmann adds, would-be satellites have been scrapped before launch due to ballooning development costs. To save money, NASA is working on “Venture” missions, which are supposed to be smaller, cheaper and faster satellites and have yet to be launched. Satellites are ideal for monitoring the condition of glaciers. The Columbia Glacier, which terminates in Prince William Sound in southeastern Alaska, is one of the world’s fastest-changing glaciers. False-color images show ice declining from 1986 to (rollover) 2011. Snow and ice are bright cyan, vegetation is green, clouds are white or light orange, and ocean is dark blue. Exposed bedrock is brown; rocky debris on the glacier is gray. May 23, 2012, Jeff Schmaltz, MODIS Rapid Response Team, NASA Aqua satellite. 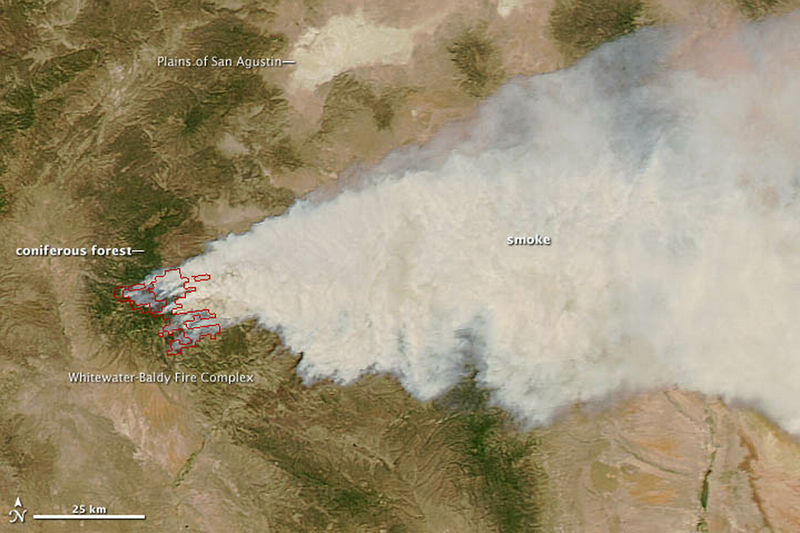 The Whitewater-Baldy Fire, said to be the largest wildfire in the state’s history, burned in Southwest New Mexico. Suomi’s visible and infrared detection equipment can measure fires, changes in river channels and ocean color, sea-surface temperature, dust storms and the material ejected by volcanoes, Gleason says. Tornadoes strike again. How do they work?